Hydrostatic Pressure-based Instruments: This technology relies upon Pascal's Principle which states that the pressure difference between two points within a vertical column of fluid is dependent upon the vertical distance between the two points, the density of the fluid and the gravitational force. This technology is often used for tank gaging applications as a convenient means of liquid level and density measure. Vibrating Element Transducers: This type of instrument requires a vibrating element to be placed in contact with the fluid of interest. The resonant frequency of the element is measured and is related to the density of the fluid by a characterization that is dependent upon the design of the element. 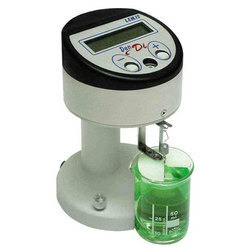 In modern laboratories precise measurements of specific gravity are made using oscillating U-tube meters. These are capable of measurement to 5 to 6 places beyond the decimal point and are used in the brewing, distilling, pharmaceutical, petroleum and other industries. The instruments measure the actual mass of fluid contained in a fixed volume at temperatures between 0 and 80 °C but as they are microprocessor based can calculate apparent or true specific gravity and contain tables relating these to the strengths of common acids, sugar solutions, etc. The vibrating fork immersion probe is another good example of this technology. This technology also includes many coriolis-type mass flow meters which are widely used in chemical and petroleum industry for high accuracy mass flow measurement and can be configured to also output density information based on the resonant frequency of the vibrating flow tubes. Ultrasonic Transducer: Ultrasonic waves are passed from a source, through the fluid of interest, and into a detector which measures the acoustic spectroscopy of the waves. Fluid properties such as density and viscosity can be inferred from the spectrum. Radiation-based Gauge: Radiation is passed from a source, through the fluid of interest, and into a scintillation detector, or counter. As the fluid density increases, the detected radiation "counts" will decrease. The source is typically the radioactive isotope cesium-137, with a half-life of about 30 years. A key advantage for this technology is that the instrument is not required to be in contact with the fluid—typically the source and detector are mounted on the outside of tanks or piping. Buoyant Force Transducer: the buoyancy force produced by a float in a homogeneous liquid is equal to the weight of the liquid that is displaced by the float. Since buoyancy force is linear with respect to the density of the liquid within which the float is submerged, the measure of the buoyancy force yields a measure of the density of the liquid. One commercially available unit claims the instrument is capable of measuring specific gravity with an accuracy of ± 0.005 SG units. The submersible probe head contains a mathematically characterized spring-float system. When the head is immersed vertically in the liquid, the float moves vertically and the position of the float controls the position of a permanent magnet whose displacement is sensed by a concentric array of Hall-effect linear displacement sensors. The output signals of the sensors are mixed in a dedicated electronics module that provides a single output voltage whose magnitude is a direct linear measure of the quantity to be measured.